The First World War has been described as the first total war, a conflict in which a country’s people and resources were harnessed towards final victory. During 2014-18 Historic England set out to uncover and study the physical remains left across England by the First World War. The range of what was discovered is astonishing, reflecting how the home front became as important as the battlefront. It was the place to train and equip new armies, to manufacture armaments, to treat the wounded and to grow more food. As millions of men joined the armed forces, women entered the workforce in munitions factories, as tram and bus conductresses and as farm workers. Archaeological remains can be found of practice trench lines, munitions works, government factories, army and PoW camps, airfields and airship stations. But England was also drawn into the fighting as German warships and submarines bombarded coastal towns, and Zeppelin airships and later bomber aircraft brought death from the sky. The threat of invasion saw the construction of defences down the east and south coasts. Ships and smaller vessels were lost to mines, torpedoes and gunfire, and on the sea bed work is beginning to explore the wrecks from this almost forgotten battlefield. A century later many traces of this great endeavour survive. 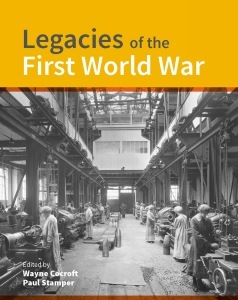 This new book brings together these discoveries and helps to mark the contribution and sacrifice not only of those who served in the armed forces, but also of those who provided support, in myriad ways, on the home front. Wayne Cocroft is an archaeologist with Historic England. Paul Stamper worked for Historic England for 20 years in a variety of roles. He had published extensively on the post-Roman English landscape, especially on medieval settlements.